present for the 'rents from Birmingham market || Christmas Eve breakfast || lucky me, the best Christmas dinner! I like Harry Potter can you tell?! 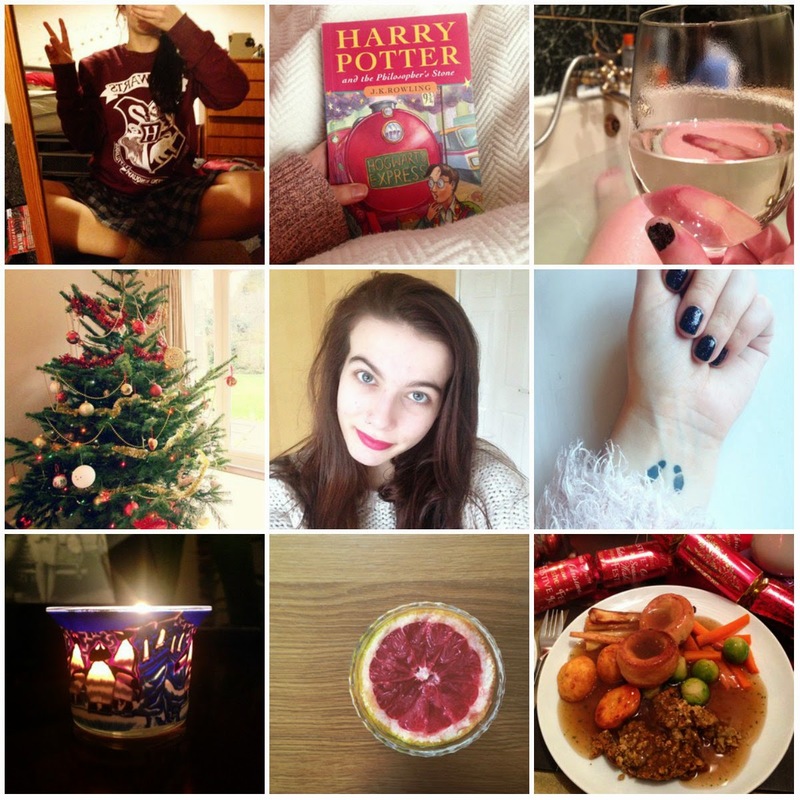 Just realised I have a photo of my sweater, the book and my tattoo all in this! *insert laughing emoji here* And for Christmas I received a book about the magical creatures which has loads of original concept art in it, so perfect for a huge Harry Potter fan and someone who loves to create. I've also been enjoying lots of good wine, I hate cheap nasty stuff that students are subjected to, so make the most of the good stuff while I'm living with my parents! I also seem to have managed to stay eating pretty healthy over Christmas, I got to ask for whatever food I wanted so I asked for grapefruits. They remind me of holidaying in the Canary Islands. My Christmas dinner was perfect (thanks mam and dad!) and I got extra stuffing 'cos it's my fave and I've been talking about it on the blog for months. Great selection - and nothing wrong with being a Potter fan! Stuffing is DEFINITELY the best bit of Christmas Dinner, anyone who says otherwise is wrong ;) And if they say they love sprouts.. well just beware!! :D So many cute photos in this blog! I'm rubbish with photography :( Whenever I try to take a quick snap of something cute, like my cup of tea and a jammy dodger, it just ends up looking like the most depressing, morbid cup of Tetley ever! But anyway! Great blog!! Glad I found you :3 Do you have bloglovin? Oh i'm all about the home made Christmas stuffing - my favorite! I have to ration myself with wine, I drink it far, far too fast haha! And a big yay for Harry Potter! Homemade stuffing is always a win, I totally took on your advice and just ate more and more. Stuffing = sanity saver! Oh same here, I kept feeling so tipsy after just one glass haha!